Create a delicious meal with this saute pan from the toughened steel collection by Le Creuset. The hard-anodized, fully encapsulated aluminum core conducts heat quickly and evenly while the magnetic stainless steel disk resists corrosion. This pan comes with a tempered glass lid that is oven safe to 425 degrees Fahrenheit. Sticky and delicate ingredients slide right off the PFOA-free and triple-reinforced non-stick surface -- guaranteed to never flake, peel or rust. The ergonomic stainless steel handle is hollow, so it stays cool on the stovetop during and after cooking. In addition, the extra-large helper handle provides safety, Comfort and ease when pouring or lifting. This kitchen staple is perfect for sauteing, simmering, braising and one-pan meals. 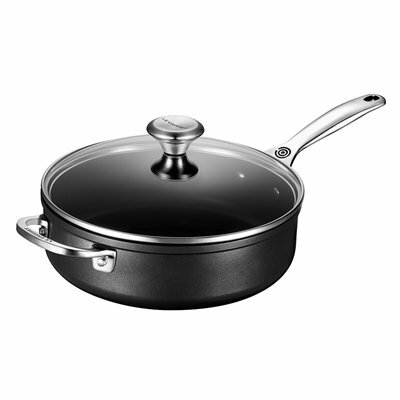 Even better, this pan is induction ready, safe for most cooktops and is dishwasher safe for easy clean up.